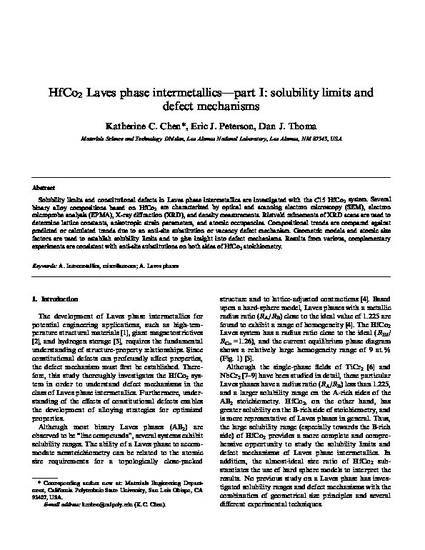 Solubility limits and constitutional defects in Laves phase intermetallics are investigated with the C15 HfCo2 system. Several binary alloy compositions based on HfCo2 are characterized by optical and scanning electron microscopy (SEM), electron microprobe analysis (EPMA), X-ray diffraction (XRD), and density measurements. Rietveld refinements of XRD scans are used to determine lattice constants, anisotropic strain parameters, and atomic occupancies. Compositional trends are compared against predicted or calculated trends due to an anti-site substitution or vacancy defect mechanism. Geometric models and atomic size factors are used to establish solubility limits and to give insight into defect mechanisms. Results from various, complementary experiments are consistent with anti-site substitutions on both sides of HfCo2 stoichiometry.